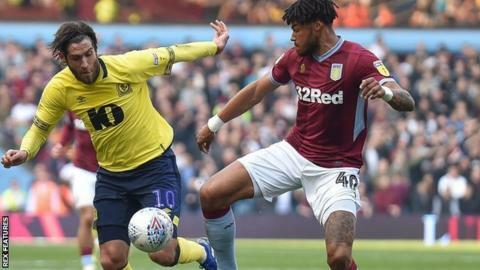 Aston Villa made it five straight wins as they beat Blackburn to firm up their hopes of a place in the Championship play-offs for the second season running. After failing to score in two of Villa's previous three home games, top scorer Tammy Abraham resumed normal service when he netted from close range after eight minutes. Defender Tyrone Mings then doubled Villa's lead on 61 minutes with the January window loan signing's second goal for the club. But Villa were made to sweat when Charlie Mulgrew's 74th-minute free kick was only parried by home keeper Jed Steer and former Birmingham City youngster Amari'i Bell followed up to score. Villa's improved form has owed much to the return from injury of captain Jack Grealish, who was under the watchful gaze of England manager Gareth Southgate, back at his former club. But Abraham has been their most consistent supplier of goals throughout the campaign, especially at Villa Park, where 18 of his strikes have come, this one proving one of his easier finishes after being set up by Anwar El Ghazi and John McGinn. He might have had another one just before the break when the ball crossed the line in a scramble also involving El Ghazi but it was chalked off for offside. Villa's next test will be against their former manager Steve Bruce at Hillsborough next Saturday when they take on Sheffield Wednesday, who are unbeaten in 11 games since he took charge on 1 February. Blackburn host Stoke City, the side in 14th, just one place and two points above them in the table. "These players have got a newfound resilience where, even when they're 1-0 up, they're confident and feel like no one is going to go and score goals against them and break them down. "It's taken a mistake for Blackburn to score and that's a credit to the players and how they're playing at the moment. "We've had a fabulous March and getting that win puts us in a good position and some momentum towards April and May, now." "We worked extraordinarily hard and you have to do that against a really good team, you have to put that into context first and foremost. "Villa have hit a patch of form, you can see the identity of a Dean Smith team on them, now. We had to be full throttle just to try and stay with them in the first half. "We pushed and pushed. I was pleased with them and I just wanted that second goal which was nearly there." Match ends, Aston Villa 2, Blackburn Rovers 1. Second Half ends, Aston Villa 2, Blackburn Rovers 1. Corner, Aston Villa. Conceded by Darragh Lenihan. Corner, Blackburn Rovers. Conceded by Neil Taylor. Attempt missed. Tammy Abraham (Aston Villa) right footed shot from the centre of the box is too high. Assisted by Conor Hourihane with a through ball. Substitution, Aston Villa. Conor Hourihane replaces Jack Grealish. Corner, Aston Villa. Conceded by Amari'i Bell. Attempt missed. Joe Rothwell (Blackburn Rovers) right footed shot from the left side of the box misses to the right. Assisted by Harrison Reed. Delay in match Tyrone Mings (Aston Villa) because of an injury. Attempt saved. Tammy Abraham (Aston Villa) header from very close range is saved in the centre of the goal. Assisted by Jack Grealish with a cross. Corner, Aston Villa. Conceded by Craig Conway. Goal! Aston Villa 2, Blackburn Rovers 1. Amari'i Bell (Blackburn Rovers) right footed shot from very close range to the top right corner following a set piece situation. Attempt saved. Charlie Mulgrew (Blackburn Rovers) left footed shot from outside the box is saved in the top centre of the goal. Joe Rothwell (Blackburn Rovers) wins a free kick on the left wing. Substitution, Aston Villa. Albert Adomah replaces Andre Green. Attempt missed. Adam Armstrong (Blackburn Rovers) right footed shot from outside the box is close, but misses to the right. Assisted by Danny Graham with a through ball. Attempt missed. Darragh Lenihan (Blackburn Rovers) header from the left side of the six yard box is close, but misses to the left. Assisted by Charlie Mulgrew with a cross following a corner. Corner, Blackburn Rovers. Conceded by Glenn Whelan. Goal! Aston Villa 2, Blackburn Rovers 0. Tyrone Mings (Aston Villa) header from the centre of the box to the bottom left corner. Assisted by John McGinn with a cross following a set piece situation.